Robyn A. Wilmoth, 1325 Wenlon Drive, Murfreesboro, was charged with driving on a revoked license 3rd offense and theft over $500 by Woodbury Assistant Police Chief Kevin Mooneyham on Aug. 21 following a traffic stop on Highway 53 South. The vehicle Wilmoth was operating, a 1998 Toyota Corolla, was reported as haven been stolen in LaVergne. Total bond was set at $10,000. Initial court date is Sept. 20. • Beverly Gene McLees, Southridge Dr. Apt. 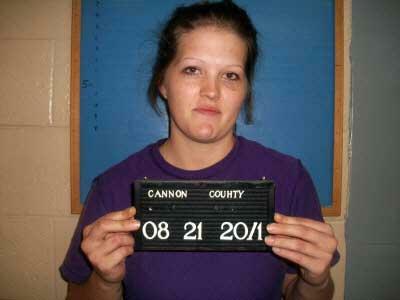 C8, was charged with vandalism and theft of property under $500 on Sept. 2 by Woodbury Police Sgt. Lowell Womack. McLees allegedly entered the apartment of Cassie Bowman and stole a wallet. Bond was set at $2,100. Initial court date is Oct. 11.